Hospitals and doctors’ offices are becoming more reliant on computers for records, medical software, and billing each year. Computer jobs in health vary widely in required training and income potential. 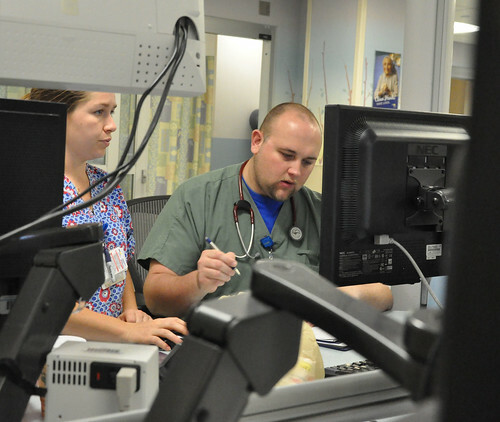 Here are five top computer jobs in the health care industry. As doctors continue to use electronic medical records, medical transcriptional will be needed to create an electronic record of doctor visits and treatments. Transcriptional notate doctors’ recorded commentary about each patient treated, what symptoms were present, and what treatment, if any, was given. Certification is recommended to get a job as a transcriptionist. This is an excellent job opportunity, because training and the work itself can be done at home online or at a business college. This career requires some knowledge of medical terms and spellings and excellent typing skills. The average wage of an experienced medical transcriptionist is $32,900 per year. Medical billing certification can be achieved at a business college or online. It involves a high level of financial responsibility, contact with patients, doctors, and insurance companies, and processing bills. A medical billing specialist helps patients set up payment schedules, and they keep track of all payments made. They may also mediate between a patient and a third party to help get bills paid. A big plus with a medical billing job is that this job can be done from home, and many billers start their own business and do billing for several different doctors’ offices. The average pay for a medical billing specialist is $22,000 to $36,000, which is similar to a transcriptionist’s salary. Sometimes medical billing and coding are considered the same field, but they are not. When a patient visits a doctor or hospital, information regarding treatments and charges is encrypted and stored. Coding professionals need to have a thorough knowledge of all the codes used by insurance companies in the billing and coverage process. This is a career loaded with job opportunities, because it is a relatively new field and not a lot of trained specialists are available yet. The salary for the level of training necessary also makes this job attractive. Salary is dependent on the amount and type of responsibilities the job carries, but the salary can range from $30,000 to $50,000 a year. Someone has to compile, organize, and maintain all the electronic records and data at a hospital or doctor’s office. The is the health information technician’s job. Certification or even an associate degree could be required for this career. This is a top job in the industry due to forecasted job growth. The Bureau of Labor Statistics forecasts growth of twenty-one percent in this field as the population ages and has more medical tests and treatments done*. The average salary for a health IT professional is comparable to that of a transcriptionist. Medical testing involves a lot of computer software developed specifically for the medical profession. The complex demands of records tracking and billing also require special software. Medical software developers are highly skilled at computer programming and need a bachelor’s degree in computer science. There is a large demand for quality medical software, so the job outlook is very good in this field. Medical software developers had an average income of $90,530 a year in 2010. As the dependence on computers continues to rise, so will the need for trained professionals to work with the technological side of health care. Experienced and qualified medical computer specialists will be essential in the next decade. Megan Duncan is a medical transcriptionist and guest author at Health Information Technology, where she has written several articles about health information technology degrees.